The Marathon World Record Has Been Broken – What Comes Next? 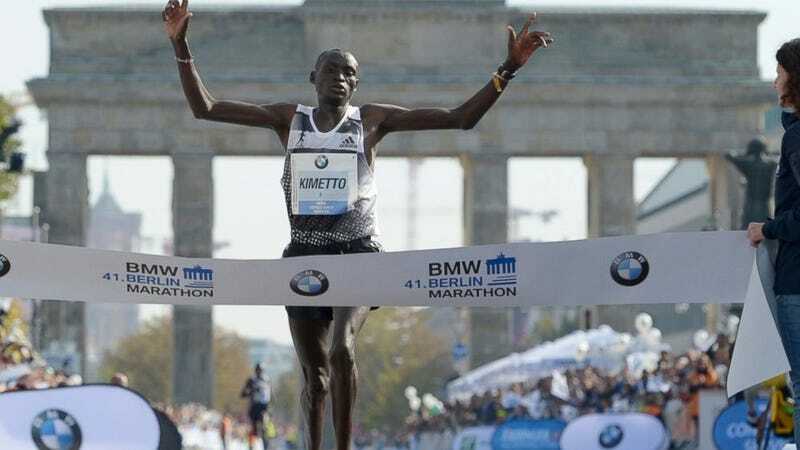 Kenyan runner Dennis Kimetto set a world record at the Berlin Marathon today, covering a distance of 42.195 km (26.2 miles) a whopping 26 seconds faster than the previous record-holder. His time: 2 hours, 2 minutes, 57 seconds. That translates to an overall pace of under 4:42 per mile (!). Kimetto's performance brings us back (as marathon WR's always do), to the perennial question: Is a sub-two hour marathon finally, really, truly, possibly in runners' sights? Well... let's talk about that. It's not just Kimetto's unprecedented time, then, but the sizable difference between it and the previous record, that's interesting. The world's fastest distance runners are now within 3-minutes of a sub-two hour marathon, and while there is reason to believe that the 2-hour milestone will not be reached any time soon, the fact that previous records are being broken not only by as much as they are, by as quickly as they are, suggests that it could happen sooner than some have recently predicted. ...if the record is broken by 15 seconds each time (I think this is a realistic expectation, particularly as it gets stronger), then one can expect it to happen perhaps once every three years. More likely four or five in the future, but if it were three, then in order to cut another 3:23 off in 15 second intervals, you're looking at around 40 years. Today, Kimetto shaved off not 15 seconds, but 26; and he did so not after three years, but one. Granted, today was reportedly a beautiful day for running in Berlin. The course itself, as the world record progression clearly shows, is also fast. Was Kimetto's performance today a case of the stars aligning just-so, or a sign that we are closer to a 2-hour marathon than previously believed? Believe it or not, I'm not so sure it matters either way. It would be ever-so-thrilling, of course, if Tucker's estimate turned out to be wrong. Earlier today, Berlin Marathon second-place finisher Emmanuel Mutai (who, it bears mentioning, also bested the previous world record, finishing in 2:03:13), set the two-hour milestone square in the sights of today's elite runners. "From what I saw today, times are coming down and down," he said. "If not today, then tomorrow... Maybe next time we'll get 2:01." Read Ross Tucker's comprehensive dissection of sub-2-hour marathon feasibility at The Science of Sport.